The history of superheavy tanks begins almost with the history of tanks itself. As early as 1916 William Tritton, one of the minds behind the famous British Mark I tank, thought of a fairly radical tank design which was to be impervious to artillery fire. The result of this plan was the so called Flying Elephant. It is unlikely this tank ever made it to a working prototype, very few documents remain today. In any case, it would have been impractical for use on the Western Front of World War One. Weighing in at about 100 tons (modern estimate) it would have become stuck in the torn landscapes of Flanders quite easily. Also, there were no engines available at the time which could have powered the Flying Elephant enough to make it go faster than maybe a mile or two an hour. Fuel expenditure and very limited range would have been another issue even if the tank had not become stuck somewhere in the first place. Thus, the Flying Elephant as the first known superheavy tank, already displays all the flaws and issues which would plague most of the following designs in times and wars to come. The German Army, too, had its own project and was actually building two prototypes of the K-Wagen at the end of World War I. At approximately 120 tons, it was even more massive than the Flying Elephant and would have faced similar problems. Still it is interesting to note that even towards the end of the war, German industry was never the less able and willing to produce two prototypes and thus got further than Britain did, even though the latter had had more time. Between the World Wars, there were some advances in tank designs, although most nations did not see the tank’s potential. After all, the tanks of World War I performed relatively poorly and most military planers saw them as nothing more than infantry support weapons. The few proponents of the tank went largely unheard or were overruled but this soon changed when the Allies faced the effectiveness of Blitzkrieg tactics employed by Guderian and Rommel’s „Ghost Devision“. Curiously enough, it was the French army which employed the first and so far only operational „superheavy“ tank. The French Char 2C was an impressive machine but plagued by mechanical problems and lack of mobility. More importantly: Its size made it an obvious target for dive bombers. The problem of air attacks was something tank designers had not given much thought prior to the outbreak of World War II, since the air force had thus far played a fairly minor role in warfare. The effectiveness of aircraft in a ground support role should have stopped every engineer from wasting time on superheavy tank designs. Their size and limited overall mobility would have made them easy targets for aerial attacks. Should have stopped. It did not. Almost every major nation participating in World War II had one or more designs either in various stages of trial or even operation or on the drawing board. World War II saw tank technology advance in leaps and bounds. Tanks became more mobile, more powerful and more effective than ever before. There was also a lot of pressure to outperform the adversaries on the battlefield in very possible way. Some of the most famous, effective and feared tank designs were developed during the war. The Tiger and Panther, Sherman, the highly versatile Valentine and of course the Russian T-34, still in service with some countries today and often regarded as the most influential tank design in history. But out of World War II also came designs for such technological monsters as the Panzerkampfwagen VIII Maus (which saw some testing and there is also a limited debate wether or not one prototype saw combat in or around Berlin), the P 1000 Ratte and the P 1500 Monster Landkreuzer (Land cruisers). One cannot help but wonder what drove them to come up with those designs. While the Maus was still able to operate on normal roads, its weight would have been prohibitive towards operation on open fields, especially near rivers since it would have become stuck in mud quite easily. Heavy rain would have had similar effects. The Ratte and the Monster were even worse. Their size would also have prevented them from operating anywhere near built-up areas, let alone cities. In addition, both types of Landkreuzer would not only have made excellent targets for dive-bombers, they would have been large enough to be effectively targeted by strategic bombers. Given the total Allied air-superiority at the end of the war, those machines would have been sitting ducks, waiting to be taken out by air-attack. Only a megalomaniacal mind could have come up with them and thought they would work, which is highly likely the reason why they were planned. Both Landkreuzer P 1000 Ratte and the Maus have since seen reincarnation in popular culture. The Maus is present in the TORG role playing game as part of the forces of Mobius and is seen in the comic Luftwaffe 1946.The Ratte appears in the first person shooter Turning Point: Fall of Liberty, the storyline of which takes place in an America invaded by Nazi Germany. The British had two superheavy tank projects going early in the war, the TOG-1 and TOG-2, both were massive designs but they were aimed for use during stalemated trench-warfare, which the British High Command was still expecting to happen in 1939, should Germany invade France. The lightning victory of Nazi forces in the West made the TOG designs obsolete. The TOG-2 has found its final resting-place on display in the Bovington Tank Museum. 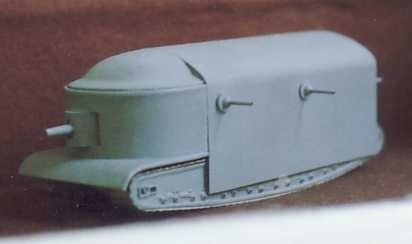 The Japanese also had some experimental designs, most notably the O-I (オイ車) and one operational superheavy vehicle may actually have been send to fight in China, but the available information is too scarce, at least as far as English and German sources are concerned, to make any definite statement. The vehicle in question is said to have weight in at about 120 tons and was multi-turreted. Interestingly, research and development of superheavy tanks continued well into the 1950s. The Soviet Union in particular put some effort into developing an operational giant tank and was successful. The Soviet Объект 279, a quite ingenious design, became operational in 1959. The project never went past the first prototype, though. A combination of political and practical reasons (such as a simple preference for lighter tanks) led to its cancellation. The USA did, as far as I could find out, not pursue any further designs based or following the T28 (a.k.a. 105 mm Gun Motor Carriage T95), which was originally designed to engage German fortifications, but this proved unnecessary, so they appeared in very limited numbers and became a dead end in tank evolution. The British had a similar design to the T28, built for exact the same purpose, the Tortoise heavy assault tank. Although five models were actually assembled, they never saw combat-action. Today, one survives, just like the TOG-2, in the Bovington Tank Museum (by the way, every Dieselpunk should go an visit, I can highly recommend this museum). Armed with a massive QF 32 pounder gun (which was more or less developed for the Tortoise) it would have packed quite a punch. This gun had the exact same fate as the Tortoise, after the tank was cancelled, the QF 32 punder was never used in another design or as a gun of its own. Given the effectiveness of air-launched anti-tank weaponry, the focus on asymmetrical warfare and a general trend towards lighter, more mobile forces, there is no place for superheavy tanks in modern armed forces. They would not be easily air-liftable, would certainly attract a lot of unwanted enemy attention and you could possibly get two lighter vehicles with more combined firepower, and mobility, for the same price. So the time of the giant tank is over without ever really beginning. Still, they have made an impression on pop-culture and military history alike and we are free to speculate about their use, performance on the battlefield and the effects they would have had, both in physical and psychological terms. It is great to be able to incorporate them in RPG scenarios, fiction and daydreams but the world is a better place without them ever being in actual use.